From the Warp: Returning from Deathwatch means what? Returning from Deathwatch means what? After reading up about the Novamarines, I came across a little blurb that talked about their involvement with the Deathwatch. After getting over the idea to do a whole Deathwatch force (which I thought would be super cool idea), I started wondering what the armour looked like of a marine who just came back from his "appointed duties." I've read that they paint their armour black except for their right shoulderpad which retains their original chapter colors when they are in service, but what happens when they return from their time in Deathwatch? 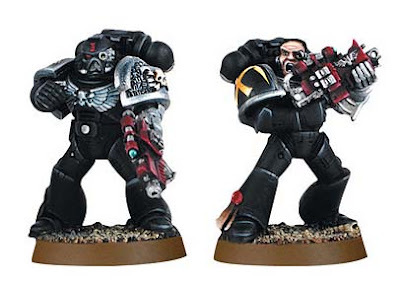 Do they leave their armour black or do they repaint it all to match their original chapter scheme? Do they still sport the Deathwatch shoulderpad on their left arm or is that taken off? I really do want to include one or two of these guys in my Novamarines force, but I want to do it right from a fluff standpoint. Anyone have any pointers or know what they do to their armour when they return to their chapter? I recall reading one of the Space Marine Battle Novels (probably the Crimson Fist one) and in it there is a marine who returned and he just keeps the shoulder pad and re-repainted his armor to his home chapter's colors. Deathwatch RPG rulebook p304 "Such an honour is afforded to a Space Marine that has served in the Deathwatch that many continue to bear the Chapter's distinctive heraldic shoulder plate even once they have returned to their parent Chapter." Deathwatch RPG rulebook p311 "The longer he serves in the Deathwatch, the more adorned with purity seals and devotional scripts a warrior's armour becomes. Having faced the vilest horros of the galaxy, the Battle-Brother knows that ultimately, it is faith that defeats the xenos." As Bazleebub hac commented, A battle-brother who returns to their chapter after they have served in the Deathwatch retains their Deathwatch shoulder pad but repaints his armor in their original Chapter colors. Agree with Anonymous, Bazleebub and Jorge. I've read the same thing around the time the new Space Marine plastic box sets came out. That's why a plastic Deathwatch shoulder pad is included on the sprue. Though the metal ones are cooler. So... how many Deathwatch 'returnees' would there (reasonably) be in a single company? Thanks guys! This helps tremendously. And I never thought about a marine collecting more purity seals and such for his actions as part of Deathwatch as well. That's a nice touch. Reece has a good question too. I'm thinking I'm going to add one guy to my army. But then again, I only have two small squads so that should be plenty for me. As stated aboye it is common for a Marine to retain the shoulder pad but otherwise paint there armour back to what it was. However you could quite easily use the rules for a Sternguard squad to represent a Deathwatch contingent working alongside your army. I don't think it would be uncommon for a for a Deathwatch force to serve for several years alongside another chapter. Snake88: Now there's a cool idea. I never thought about doing that. A small contingent that has been attached for an operation. I would check out the Deathwatch RPG book, it has a ton of fluff and more indepth info on the Deathwatch. Including what they're armor contains and how it should be painted. So it can translate to a model pretty easily. IIRC, the left shoulder is replaced with the Deathwatch shoulder, and painted silver. Same with the whole left arm and glove. The rest of the armor is painted black except for the right shoulderpad, which is the chapter symbol from which the Space Marine came from. (This is not to upset the machine spirit within the armor) That is the only point there should be color within it. Honestly, take a look at the Deathwatch RPG core book, it has a ton of pictures to get an idea of it as well! Or if you want to have a squad of deathwatch marines, you could make a squad, and use them as sternguards. The positive side of this, that you could go all out on said squad, and use wolf/dark angel/blood angel and other bitz to make them really characterful. From a fluff standpoint they could be serveing with your army for a short time. Just an idea, I had to throw up here. Good luck for building your army, hope to see more soon. And then I woke up, drank coffee and realized the ACTUAL question. As stated above, if they return to their chapter they repaint the armor to the chapter colors and return the shoulderpad and equipment to the Inquisition. I really like the idea of incorporating a small squad of these guys into my force. The idea of being able to do a number of other chapters as single models (even though their armour will be black) is kinda cool. Fayte: So you're saying they return the shoulderpad as well? Yes, it is only to show that they are in a new "chapter" because they leave theirs behind. A lot of fluff goes with that, but they replace their normal shoulderpad with the Deathwatch one and if they are returned to their chapter, they return it. There is probally dueling sources. I remember hearing they keep the deathwatch shoulder. But then again there is no mention of Uriel Ventris having a DW shoulder. I guess the correct answer is whatever looks coolist. I'm going off of the Deathwatch RPG stuff, so I am probably wrong. I think that stuff is sanctioned by GW.....so.....maybe? No, say it isn't so... two source that conflict. That's so odd, I'm not sure I've heard of that before. I think the rule of cool might be the way to go for sure if I make him as though he has returned to the chapter. But thinking about adding a small squad to the force does sound cool as well. Ron, I don't want to promote my blog on your blog but I've done a page on using Deathwatch in games of 40K. Taanekh: If you've got a link that will help, by all means, share it! It's the spamming that I don't like, but a link to helpful info is always welcome. I'm sorry, I'm new to blogging so not sure how to link you straight to the page. I thought I'd read somewhere (a short story or the like) that they got to keep the bolter as well but I think that was wishful thinking. I thought about doing an entire Deathwatch army, too. The Space Marine veterans work well, but I used the Dark Angels veteran squad. Thanks to the FAQs, every DA veteran in a squad can take a special weapon, with the exception of a single heavy weapon and some of the weapons like flamers. It helps that the setup I picked makes an even 200 points for a killteam special mission. But on your original question, I think as others have pointed out, the armor goes back to the original colors, but he keeps the DW shoulder pad if he's sufficiently bad-arse. Dont' forget to include all those special bits he's earned in his time with the 'Watch. How about a Black Templar squad? Their armor is already black and they could have kept the shoulderpad & any purity seals and any other battle recognitions. That bit in your first picture (the left shoulder) I thought was a right shoudler, and was the pad that was retained when the marrine returned to his parent chapter. I figured hard evidence (a sprue from GW) spoke better than forum goers. I'm also doing the deathwatch - sternguard thing. I've made a space wolf and ultramarine so far (with their unique bits). It's an excuse to have really unique and personalized models that are playable in a regular army. I'd strongly suggest you do take that idea up as others have said. I haven't read the deathwatch RPG stuff, but as to my understanding a returning marine keeps the pad. Some fluff says that when they go back, the pad goes on the left and the chapter pad goes back to it's place of prominence, and some says the pads stay the same. But until Fayte said they give everything back, I'd never heard that they gave back their pad too. I knew it was on a book! In Rynn's World, there's a character name Werner that is back from the Deathwatch. "The greatest mark of honour Werner bore was not on his face. It was on his left pauldron. Rather than display the Chapter's standard iconography there, Werner wore the exquisitely cast skull sigil of the legendary Deathwatch, chamber militant of the Holy Inquisition's Ordo Xenos. He has served that august body for seven years before returning to his Crimson Fist brothers, and even then, he could tell them nothing of his time away"
A Deathwatch army is a concept I've had for some time, the conversion possibilities are huge, I really look forward to your work! Sternguard are a very viable choice for Deathwatch, the special ammo is very similar to the old Deathwatch rules. The rules also involved Librarians for Deathwatch teams as Sergeants instead of Captains. The Ordo Xenos insignia is always on the left shoulder pad, however a lot of the artwork shows a notch in the middle of the bottom edge of the armour, this isn't present on either the plastic or metal variant pads. in a vanilla list, i dont see why a sternguard squad could not be kitted out with the DW gear, i mean thats what they are really. i may have to do that for my Blood Angels sternguard :) add a little twist to their history, a small group of hulk scouring veterans get called into service of the OX and return to the chapter after a reasonably successful crusade against the xenos scum, better to serve in their power armour with Specialist Weapons And Tactics. but what about Tactical Dreadnaught Armour? would those guys just replace the crux with the OX one? Until Tangata Honu quoted that novel, though, I didn't know whether or not the Marine would continue to wear the DW pad on his left shoulder (this is actually a topic of heated discussion on several boards). Now I have at least one source to indicate that it remains on the left shoulder. Taanekh: Next time, if you have a specific post, you can copy it (the URL) from your browser and paste it in your comment. That way we can jump right to the relevant post on your site. I encourage anyone with appropriate content that matches the post here to include links in their comments so we can all benefit from the additional info. Oktane: Interesting. Unfortunately trying to model ammo is going to be tough. They don't get to keep the shoulderpad? JustPlainJim: Someone else mentioned the trinkets they would collect while on duty as well. I actually think that's an even more interesting aspect of the modeling. Anon: Jumping to Templars might be a bit tough for me to do now. TheAmbit: It is very tempting to do a small unit of thee guys to add to the force. Of course I need to get the force done first. legoss: Seems as though we have some conflicting info from different sources. Surprise! Tangata Honu: Excellent stuff, thanks! Mohaniker: Interesting. I'll have to look at the Lexicanum article to see what you mean about the shoulderpad. cpt codpiece: I think terminators might put the Deathwatch shoulderpad on the right hand side so as not to disturb the crux? I don't know. James: I think we're safe pretty much however we do it. In the 40k universe you can justify just about anything. I'm wondering what terminators do now with the crux on their left shoulderpad. 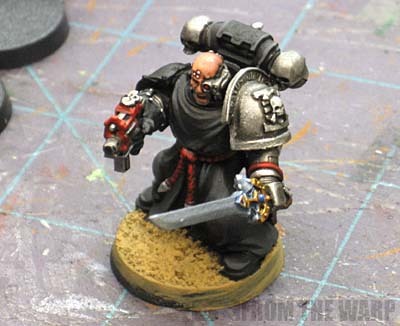 Page 130 of 'Rites of Battle' for deathwatch shows a terminator with the Deathwatch pad on his left shoulder as normal. Doesn't show a crux (right is obscured). I'm sure there's more images but that's one I remembered. Crux versus DW pad is a hard one. There's a lot of fluff about each Crux containing a piece of the Emperor's armor, so you'd think that it would get the place of honor, even while the Marine is actively serving with the DW. Here's a heretical notion; the Marine TheAmbit is talking about hadn't yet earned Terminator honors and wasn't in his veteran company when he joined the DW. The Marine could have been wearing a suit of Terminator armor owned by the Ordo Xenos (the suits are so rare that you'd think a chapter would be reluctant to let one go for a few years). I think the Crux Terminatus is purely an Astartes honor, so a suit maintained by the Ordo Xenos could be expected to bear the DW pad on the left shoulder, instead. Unfortunately for those of us who want our models to match the fluff just right, GW itself isn't consistent with placement of the Crux, at least when it comes to the power armor version. Most of their models wear it on the left while a few wear it on the right. Just to keep consistency in my own army, I always put it on the left. and the entire left arm is electroplated silver, and polished to a high shine. At the centre of the plate is the icon of the Deathwatch — the Inquisitorial ‘I’, mounted with a death’s head and crossed bones. Around the icon passages from various devotional texts are engraved, including the Catechism of the Xenos and the Third Abjuration of Terra. The Crux Terminatus is indeed an honor and its placement is traditionally on the Left shoulder, although it may be placed on the left knee when using power armor. The Crux Terminatus, or Terminator Honour as it is also known, is among the most famous of all the Honours to be found within the Codex Astartes. within it a tiny fragment of the Emperor’s armour worn during the climactic battle with the Arch-traitor, Horus over 10,000 years ago. Smaller representations of the crux are frequently worn by the honoured veterans who have earned it when they fight in power armour. These small icons (often of bone or metal) are often hung from banner tops, weapons, and belts. behind the skull are often added for Terminators trained as Assault units wielding lightning claws and thunder hammers with storm shields. Variations include the size and dimensions of the skull and the removal of the crossed lightning bolts or bones or their scale in relation to the shape of the cruciform. This is so cool to read all the background on these guys and the effects serving in Deathwatch has on their actions and equipment. Thanks to the folks who have the info for sharing it! DW shoulderpad is a badge of honor. It tells everyone that this marine has served under the DW elite, and therefore is a reliable expert on xenos matters. Ultra's tyranid hunters have been trained under DW according to some fluff but I don't know if this unit has been retconned out of the game. DW shoulderpad is a good choice because WYSIWYG. Kynikos: Absolutely. It's a bit part of a Marine once he returns from service. I just want to make sure I get the most from this modeling opportunity and represent it on my model the right way or at least in a way the fits with the background. According to the Deathwatch article, a marine who enters the Deathwatch paints his armor black, but the left shoulder pad retains his chapters original colors as to not upset the machine spirit. After his service, he returns to his chapter, and is permitted to retain the chapter badge of the Deathwatch on his right shoulder, so as to display the honor of having served in the Deathwatch. Ukai: I definitely want to capture that honor on my models. Well i just ordered the Deathwatch RPG core rules, so when it arrives, i will have a look through it. Our local forum is looking to run a DW Role play over the forum, we are designing our characters atm, we are looking at coming from a world circa 18th century tech. I am looking at being an arbiter sort before i was taken to become a Novamarine...well it is in line with our current discussions on FTW lol. Richrd Rose: I'd be interested in hearing what you find out. I'm particularly interested in terminators and how they wear their shoulderpad in relation to the crux that is already on the left shoulder. Jorge: I thought sporting it (the smaller crux) on the left knee was for guys who were wearing power armour to show that they were permitted/trained to wear terminator armour.